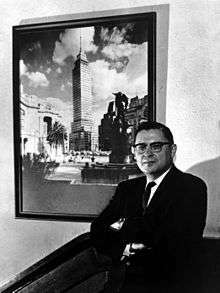 Nathan Mortimore Newmark (September 22, 1910 – January 25, 1981) was an American structural engineer and academic, who is widely considered as one of the founding fathers of Earthquake Engineering. He was awarded the National Medal of Science for engineering. In 1932 he received a M.S. degree and in 1934 a Ph.D. degrees for thesis tilted Interaction between rib and superstructure in concrete arch bridges, in civil engineering from the University of Illinois at Urbana-Champaign. After graduating from UIUC, Newmark was appointed to many prestigious positions in the department. He became Research Professor of Civil Engineering in 1943. He served as Chairman of the Digital Computer Laboratory of the University from 1947 to 1957 and in 1956 he was appointed head of the Civil Engineering Department and held the position until 1973. Newmark held many important leadership positions and the reputation of the longest tenure on the University Research Board. He continued as a professor there until he retired with a rank of Professor Emeritus. Under his leadership, the program at the University of Illinois at Urbana-Champaign soared to new heights. The civil engineering laboratory on campus now bears his name. In 1959, Newmark introduced what became known as the Newmark-beta method of numerical integration  used to solve differential equations. The method is still widely used in numerical evaluation of the dynamic response of structures and solids, such as in Finite element analysis. He later helped to develop the first digital computers, the ILLIAC II, which was one of the first transistorized computers. It was also designed to use transistors that were not even invented yet. The ILLIAC-II eventually led to the development of computer software for engineering. Newmark also made significant contributions to geotechnical engineering. He developed a new method, named after him (Newmark's sliding block method)  of calculating displacements in earth dams and slopes due to earthquakes. His work was acknowledged with an invitation to deliver the 5th Rankine Lecture of the British Geotechnical Association, entitled Effects of earthquakes on dams and embankments. The American Concrete Institute awarded Newmark the Wason Medal for Most Meritorious Paper in 1950. In 1968, he was recipient of the National Medal of Science for Engineering Sciences. He was elected Fellow of the American Academy of Arts and Sciences (1962), and received the 1979 John Fritz Medal and several other awards. The American Society of Civil Engineers has named a medal after him, which is awarded "to a member of the American Society of Civil Engineers who, through contributions in structural mechanics, has helped substantially to strengthen the scientific base of structural engineering." In 1964 he contributed to the founding the National Academy of Engineering (NAE) and two years later became a member of National Academy of Sciences (NAS). ↑ Newmark, N. M. (1959) A method of computation for structural dynamics. Journal of Engineering Mechanics, ASCE, 85 (EM3) 67-94. ↑ Newmark, N. M. (1965) Effects of earthquakes on dams and embankments. Geotechnique, 15 (2) 139-160. ↑ "Wason Medal for Most Meritorious Paper". American Concrete Institute. Retrieved November 20, 2014. ↑ "Book of Members, 1780-2010: Chapter N" (PDF). American Academy of Arts and Sciences. Retrieved June 14, 2011. ↑ American Society of Civil Engineers. "Nathan M. Newmark Medal". Archived from the original on 2007-09-30. Retrieved 2008-01-21. ↑ "Founding members of the National Academy of Engineering". National Academy of Engineering. Retrieved 2012-10-21. ↑ Richard G. Weingardt, P.E. (2005). Engineering Legends.